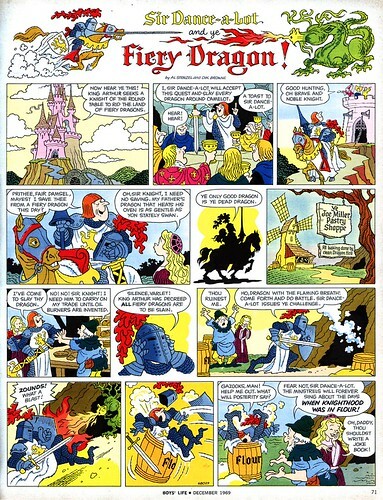 Another past president of the National Cartoonists Society, Dik Browne, is probably best known for his long running Hägar the Horrible newspaper comic strip, as well as for his co-creation of Hi and Lois with Mort Walker. But Browne had another long affiliation; with advertising comic strip studio Johnstone & Cushing. 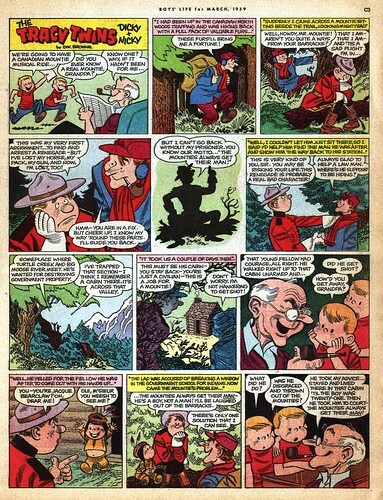 It was at J&C that Dik Browne produced "The Tracy Twins" and many other comic strips for the studio's Boys' Life magazine account. It boggles the mind that Browne had the time to draw a daily nationally syndicated comic strip and still produce material of this calibre for J&C, something he managed for many years. And Boys' Life was only one of many J&C accounts Browne would have worked on. He created untold numbers of advertising comic strips on top of his already astonishing workload. 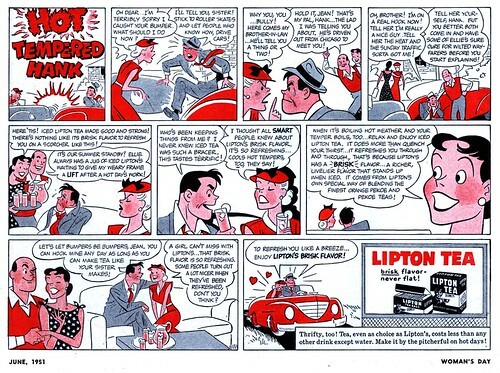 I don't know if Browne is responsible for the Lipton Tea ad below, but its a good example of the sort of advertising strips that were very popular during the 40's and into the 50's, and the similarity of style certainly indicates that someone of Dik Browne's calibre would have been much in demand for all sorts of lucrative advertising assignments. In fact, Tom Heintjes, in his seminal article on the history of the Johnstone & Cushing studio, writes,"Browne was one of the company's most prolific artists. 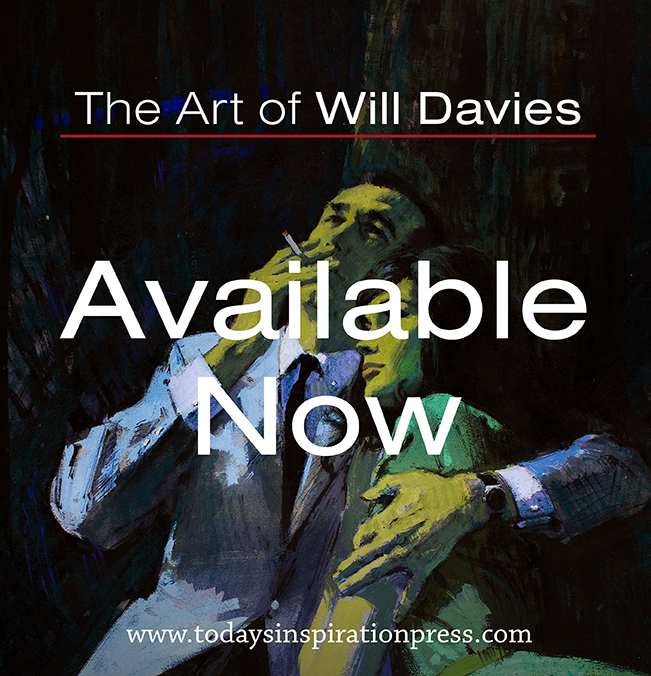 (He was renowned for his ability to draw without looking down, the better to carry on conversations.) Among many assignments, he created the Chiquita Banana symbol and gave the Campbell's Soup kids, originally done in 1905 by Grace Drayton, a contemporary look. He also created ads for Mounds candy bars, one of which caught the attention of Beetle Bailey creator Mort Walker." According to Heintjes' article, Dik Browne described his time at Johnstone & Cushing as "some of the happiest of his career. "I have more funny stories about Johnstone and Cushing than about any other part of my life," he said in [an] interview. "That was the funniest place, we were all young and gay, and none of us were making a great deal of money at one time, and then some of us made a great deal of money." Fellow NCS member and J&C regular, Gill Fox once said, "Dik was my hero. I would stay late at the office, when no one else was around, and I would pull out Dik's portfolios just to look at and study his work. I learned so much from Dik. We all knew how good he was, and we all knew he would hit it big. We just didn't know how he would hit it big." My Dik Browne Flickr set. My Comic Strip Advertising Flickr set. I sincerely hope that there may be one day a HISTORY OF JOHNSTONE & CUSHING book with lots of art. I second THAT motion, brother! "He was renowned for his ability to draw without looking down"
And by the way, I'm blown away by the detail Dik put in those Tracy Twins strips. There's shading and cross-hatching and black spotting happening here. 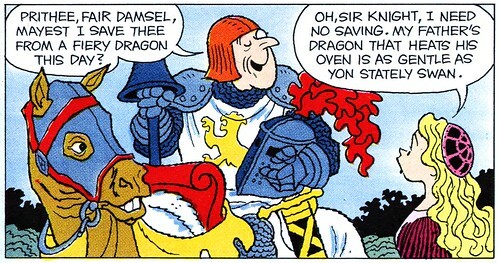 My whole life I've only seen his simplistic (but nice) one-dimensional cartoony art with Hagar and Hi & Lois. 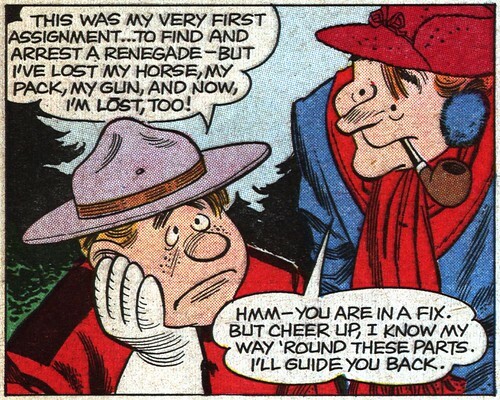 Gee, I guess he learned early it doesn't pay to do any rendering in the world of cartoon strips. I was really taken by Browne's beautiful textural line work as well, Les. The article I referenced in today's post tells how Mort Walker encouraged Browne to use his simplified "slick' advertising style for Hi & Lois - so that might have been why he adopted the look we're more familiar with. Also, with the shear volume of work Dik Browne was producing, I can only imagine he had no choice but to simplify for the sake of expediency!